I'm back, not that you knew I was away; I made a quick trip last week to check in on my folks. all is well with my parents and it was a treat to see them. my only complaint is the days passed way too quickly. speaking of tempus fugit, most of the time I feel as if it should be august or september and not getting on late november, this visit was nice that it did kick me forward and now I feel a bit more like I'm stepping into the holiday season. 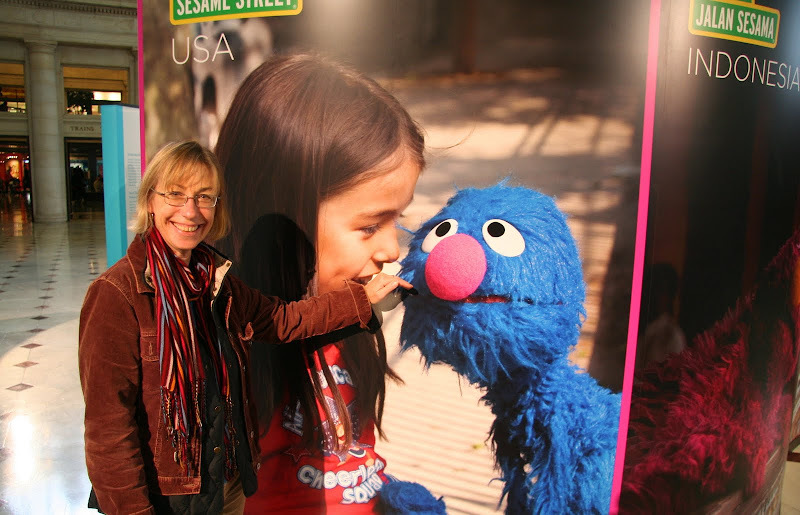 my trip got off to an auspicious start when I got off the train at union station and walked into the main hall only to find a sweet photo exhibit celebrating the 40th birthday of my favorite street in the world- sesame street! although most of my time was spent with family, I did manage to get spend saturday wandering the cultural landscape of washington d.c. with a couple friends. one stop was the national postal museum (which is part of the smithsonian). my enjoyment and enthusiasm for the museum, probably confirms any suspicions about my inherent nerdiness! it is a fascinating place filled with all sorts of interesting bits of history and trivia about all things postal. how many of you knew that fdr was a stamp collector and major stamp freak? anyone who takes the time to micro-manage the design of stamps while serving as president of the united states has to be a bit beyond the pale when it comes to loving stamps. after all, it wasn't as if the united states was coasting along experiencing a sustained period of peace and prosperity when ol' fdr was the prez! it is a very interesting and stimulating museum. for now schedule and routines are calling. it's monday night and that means one thing here on avenue c - movie night and checking out this week's set of shorts for the film festival. I hope most of them are good, it looks like we are going to have a few new people coming. thank goodness lin volunteered to host and organize the food! friends are so fine. perhaps there will be more on the mouse's adventures in washington dc another day or perhaps not, we'll just have to see what the week brings! I hope all my friends in the bloggyhood had a good weekend, geez, I haven't even started checking out last week's tt players....boy am I late! tired feet, written and performed by singer songwriter alela diane. alela's voice has such a haunting and ethereal quality about it, don't ya think? I'd love to see that main hall! All part of the retirement plan I assure you and tired feet? Yep, know how that feels! baino - did you get a virtual peak at the main hall by clicking on "main hall"? it is fantastic - 25 yrs ago it wasn't so much. yep, my dogs (feet) are still tired....today lots of walking to connect with trains, planes and buses to get back home. Weird. My first thought when I read "postal museum" was "I bet that place smells good". I guess because I always liked the smell of paper and things, and because the oldest post office I've ever been to always smelled so nice. I think I'm freaking out....I thought I saw Lamb Chop in one of those photos. cm - that little fellow is a muppet used, I think, on the indonesian version of sesame street. I took the pic of the pic precisely because he reminded me of lambchop, who I absolutely adored as a child. alas, I didn't write down the fellow's name and should have it was something very unusual. love the picture. are you from washington d.c. originally? one of my college suite mates was from there and you remind me of her. btw my word verification is bodazent, which i'm quite taken with. like bodacious and dazzling and ardent mixed together. Great photo. No offense to you and Kermit, but Grover was always my favorite Muppet. He was so manic, always trying to please. Though I also loved the somewhat obscure Roosevelt Franklin.